Portland’s food cart scene is one of the most dynamic and explosive in the country. What’s exciting to see is how the food carts are growing and flourishing beyond the defined cart clusters (or cart villages like SE 12th and Hawthorne, often called “Cartopia”). This month the scene got a huge enforcement when Burgerville decried ‘if you can’t beat them, join them’ and launched its own mobile food cart called the Burgerville Nomad. Launched on the hottest day in Portland in over twenty years, Portland’s newest food cart helps fill the gaps in the dining options on SE Hawthorne. Located on SE 33rd and Hawthorne, tucked behind the Dollar Scholar, Valhalla serves up a simple and affordable menu that is sure to quickly find a following. While the menu might be simple, the tastes are anything but. 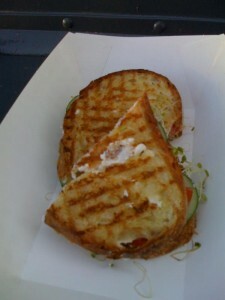 I had the Vegan Garden sandwich, which came panini-grilled on two slices of Grand Central Baking Como bread filled with Tofutti cream cheese, cucumber, sprouts and tomato. The bread was brushed with a rosemary vegan butter and grilled to absolute perfection. All the ingredients in the sandwich were fresh and the tomatoes were bursting with flavor. The sandwich cost only $5 – $3 less than its equivalent across town. 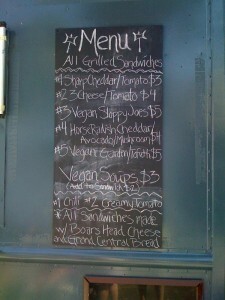 To accompany the sandwich I had a cup of the Vegan Creamy Tomato soup. More subtle in flavor, the soup was not overly creamy and had a nice mix of flavors. It’s not your plain ordinary tomato soup and it’s clear a lot of tought went into the combination of flavors. The rest of my family got the three cheese and tomato sandwich ($4) which featured Boar’s Head Cheese on Grand Central Bread. Also cooked to perfection, these grilled cheese sandwiches were gobbled up in no time. Next time I visit Valhalla (and there will be many next times) I’ll try the Vegan Sloppy Joes which were highly recommended by Woodard. He also indicated that he’d be carrying homemade pickles that are sure to impress. With fantastic food at good prices, Valhalla should do extremely well and show that great carts can succeed even when they are outside the cart clusters. 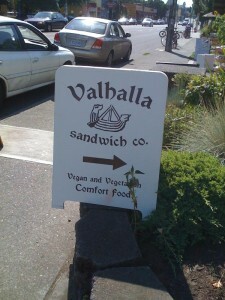 Valhalla Sandwich Co. is located at 3279 SE Hawthorne Blvd (right behind Dollar Scholar). Hours haven’t been set yet but they should be 11am to around 10pm daily.